With our Beocreate 4 channel amplifier we introduced a full featured digital signal processor (DSP) to the world of Raspberry Pi audio applications. While the main goal was to up-cycle old loudspeakers, we wanted to offer the maker community a DSP that they can use in any way they like, without pre-defined filter setups or “applications”, but full access to the DSP. This allows you to create DSP programs for all kinds of applications – not just simple crossovers or equalisers. We have seen already users creating FIR filters and room equalisations on the Beocreate board. But we know that not everybody needs a full 4-channel amplifier. For some applications like room equalisation a smaller board with fewer features would be good enough. Here it comes: the DSP/DAC. It is the board you always wanted, but were afraid to ask for! The DSP/DAC uses the same full-featured DSP that is used on the Beocreate 4 channel amplifier and combines it with digital inputs and outputs and a Stereo analogue output. The easiest thing to do is to use the DSP/DAC as a DAC for the Raspberry Pi to play back music – as you would do this with our “normal” DAC+ boards. But in this case, you have the added benefit of a high performance DSP to adjust for your particular needs. For those of you who have an old CD player or TV to play back music just connect the TOSLink output of your CD player or TC to the TOSLink input of the board and get the analoge signal on the RCA output. You can even do this without the Raspberry Pi. However, you need to feed 5V to the board as it would normally be powered by the Raspberry Pi. Many audiophiles fear sample rate conversions. There is a lot of discussions about “being bit-perfect”. However, a it’s a simple fact that basically all DACs on the market do not perform equally well on all sample rates. Some people might prefer 48kHz playback, others wants to use the highest available sample rate of 192kHz (that’s the limit of SPDIF). Do you have any preferences? With different DSP settings, you can try by yourself to see what works best for you. The performance parameters of the integrated asynchronous sample rate converters (dynamics, distortions) are better than the analogue performance of your DAC. Don’t be afraid to try it out. The major challenges in audio playback isn’t the electronics. While different components can have an impact on audio performance – there is one component that definitely will have a huge impact – the room that you’re listening in. The same electronics and speakers can sound very different in different rooms. Not only the walls of a room, but every piece of furniture in it will reflect parts of the sound waves and absorb other parts. Especially in the low frequency range, where there is a lot of absorption which can create all kinds of problems. Some frequencies might be very loud, others might be almost inaudible. This is normal and you can’t completely eliminate the effects of rooms acoustics. However, you can improve the performance of your setup. The easiest way to do this is to find room resonances and reduce the volume of the sound at these specific resonance frequencies. Sounds complicated? Luckily there are tools like REW that do a lot of the measurements an calculations for you already. We’ve already created a guide how to use REW with our DSP toolkit. You have some cool ideas to change the parameters of a DSP program on the fly? What about dynamic reduction that automatically gets activated at night? Yes, we all love high dynamics, but sometimes our neighbours don’t. Or you want to use a different equaliser set for TV playback than for music playback? Everything is possible. The DSP can be programmed directly from the Raspberry Pi. You can change parameters can be done with simple command line tools. 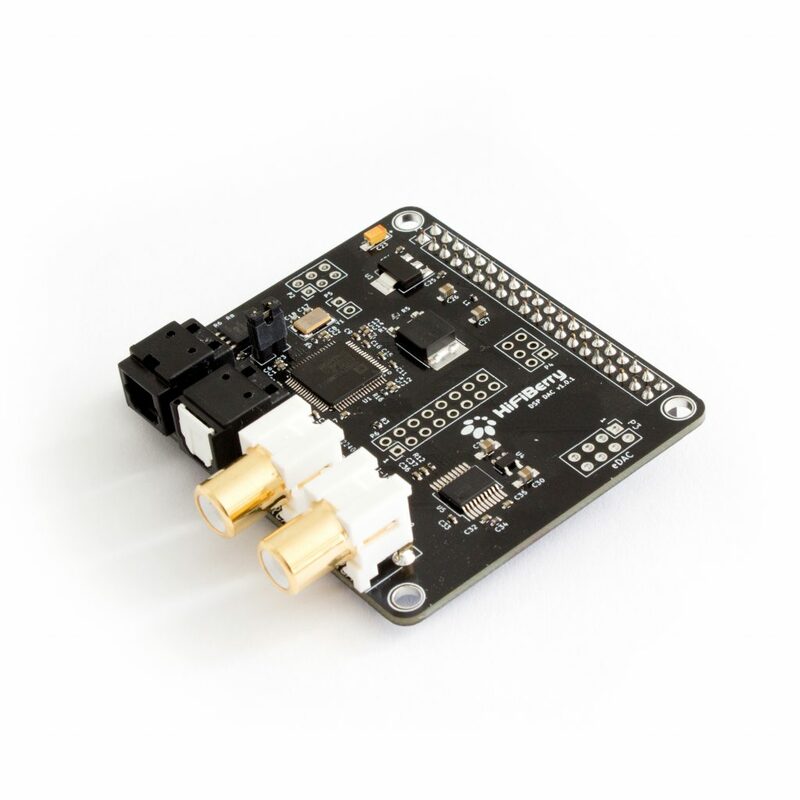 We already see a lot of users using our DAC+ Pro to connect external I2S DACs. With the DSP/DAC this will be much easier. The reason for this is the fact that you can select specific I2S output formats with the DSP/DAC. Note: This is really something for advanced users. You should know a lot about I2S and you should also be able to debug this with an oscilloscope. With Analog’s SigmaStudio, you can create your own DSP program and implement whatever you like. What about an adaptive loudness function? Check out this project. Want to run FIR filters? You can easily run two 4000-tap FIR filters on this powerful DSP. We know that many of you will have all kinds of ideas. Let us know what you want to do!